Plenty of attention is being paid to the political and constitutional effects of Brexit, but what will its economic impact be on life’s most basic commodities? How did food prices inform the debate in the weeks and months leading up to the referendum, and how have they informed debate in the past? How have the spectres of want and hunger been invoked over the last century and a half in political contexts, and are we paying them enough attention now? Chaired by Dr Marc-William Palen (Exeter), four historians and policy makers debated these questions at King’s College London on 25 August 2016. 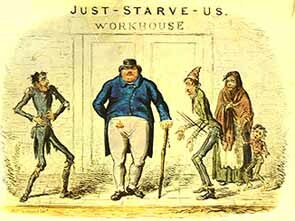 Their combined expertise covered the period since the 1840s, the “Hungry Forties,” which live in political memory as the UK’s last serious sustained period of food poverty. The discussion, an initiative of History & Policy’s Global Economics & History Forum (@HandPGlobal) and sponsored by the Economic History Society and Imagining Markets, was aimed at policy makers and practitioners working in the area of food poverty and food security, and attendees came from the Food Standards Agency, the health sector, private consultancy and academia as well as interested members of the public.